Addis Ababa — United States of America will continue to provide the necessary support to further underpin the ongoing reform in Ethiopia, Congresswoman and Chair of the House of Foreign Affairs Sub-Committee on Africa, Karen Bass said. 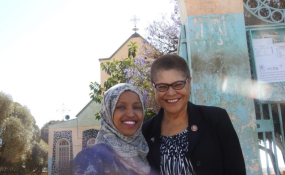 In a press conference she gave to journalists on Monday after concluding her 3 day visit to Ethiopia and Eritrea, Karen Bass who is also Chair of the Congressional Black Caucus appreciated Prime Ministers role at the Horn of Africa. "I was excited at the changes and reforms that are taking place here and it was great to be back and I am leaving with a long to do list of things that I need to do when I get back to Washington to help in anyway and every way we can to further the reforms here in Ethiopia," she pointed out. She stated that her country will provide the technical support that was requested by Ethiopia in a variety of areas, and added particularly in regard to democracy and election. Mentioning that African Growth and Opportunity Act (AGOA) is due to go out in six years, Congresswoman Karen Bass urged countries to develop strategic plans on how to take advantage of it. Furthermore, she anticipated that "it will be interesting to see what happens with AGOA when the continental free trade agreement is developed and adopted." US Ambassador to Ethiopia, Michael Raynor said that the essence of the partnership with security is important aspect, and added "has enormous regard to peacekeeping role that Ethiopia has played and continue to play. We support that role and will continue to support." "The scope with that partnership can and will expand under current realities when we have such continental views on political side as well as the security side," he pointed out. According to him, Ethiopia's shift towards free market economics is something which will serve the Ethiopian people and create commercial opportunities for Ethiopian and American private sector. "We are looking very hard at ways that we can resource our support for the reform agenda beyond the traditional areas of development and humanitarian assistance we have been sustaining and continue to sustain," Ambassador Raynor confirmed. Raynor explained that his country is putting additional support on democracy, electoral support, civil society, and to create robust private media. "All of these prepare all the conditions needed to support credible elections," he noted. "We are complementing that with a range of support underway including additional support to analyze constraints of economic growth and devise plans of action to address them, including imbedding senior US government officials at key Ethiopian economic ministries and operations for a sustained period of time," he elaborated. Speaking of the support to strengthen the Ethiopian security, he said that US will focus on capacitating the institution to maintain appropriate balance between law and order, respecting people's rights to express ideas in peaceful and constructive ways.